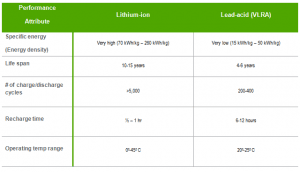 Defining a lithium-ion battery and what makes them different from lead acid. In the simplest of terms, a battery is an electro-chemical device that stores energy and releases it as electricity to load a circuit. Batteries are typically organized in strings and can be connected in series, in parallel, or a combination of both to achieve whatever voltage and current is required for a given application. This simple description applies to both lead acid and lithium ion batteries. 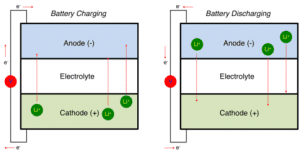 Every battery contains a cathode (positive) and an anode (negative) that are suspended in an electrolyte. This acts as a catalyst for the electrochemical reaction which results in charging and discharging as ions flow from one electrode to the other. It also prevents electrons built up on the anode from flowing back to the cathode within the battery itself when no load is attached. The chemical reaction results in a potential difference in charge (i.e., voltage) between the cathode and anode as electrons build up on the anode. By connecting a load with a wire to the battery’s terminals, current flow is induced which discharges the battery as electrons flow (i.e., current) from the anode (negative terminal) to the load and then back to the cathode (positive terminal). The chemistry of the battery changes as this ion flow occurs until no more electrons can be supplied to the anode which results in a discharged battery. The battery can be recharged by using an external power source to reverse the flow of electrons through the electrolyte from the cathode to the anode. Figure 1 shows a simple diagram of the flow of electrons within the battery and between it and the load. So, the principle difference between a lithium-ion battery and a lead-acid is the chemical makeup of the materials used in the electrodes and electrolyte. Lithium-ion batteries use a metal oxide for the cathode and a carbon-based material for the anode. The electrolyte solution is a lithium salt dissolved in an organic solvent. A lead-acid battery, on the other hand, uses a lead dioxide for the cathode, a lead anode, and a form of sulfuric acid as the electrolyte. It is this chemistry that largely determines the battery’s performance capabilities. Table 1 highlights some of the high level performance differences between the two types of batteries as used in UPS applications. However, it is important to understand that there can be a lot of variability in performance between one battery and another of the same type due to differences in chemistry (i.e., composition of electrolyte and electrodes) and on the overall quality of the materials and cell construction. This table shows typical performance ranges for the kind of battery cells being used in UPSs today. To learn more about the impact of lithium-ion batteries, check out my whitepaper here. Great article! For my senior design project I had to build a Quadcopter and learn a lot about lithium ion batteries. I often wonder if people are also looking into methods of reducing the size and weight of these batteries while keeping the same specifications (specifically a 6S lithium ion battery).